Wow, this is my first ever review request and I’m super excited! Hey guys! It’s Amy! I know I disappeared for a while, but I kept up my Instagram (which has now surpassed 100 followers? WHAT!?!) and I keep steady updates on there, so if you’re ever looking to contact me ASAP, that’s probably the quickest way. 🙂 Anyway, my laptop was completely crashed and unusable because I had opened wayyyyyyyy too many tabs. I couldn’t bear to delete you guys! I had a friend do it, because it was going to literally break/shut down/mess up my whole laptop. Also (and I’m not sure why this is), all of my emails from before the end of February are gone! This means that I lost (approximately) 20 review requests, most of which I know I did not respond to. I’m very sorry about that; I’m looking to get a review policy up ASAP so that it is less confusing, and if you’re reading this and you sent me a review request that never got a response, it was deleted, and I would LOVE to hear from you again. That being said, some have now popped up on my iPad, and I will reply to those as soon as possible. 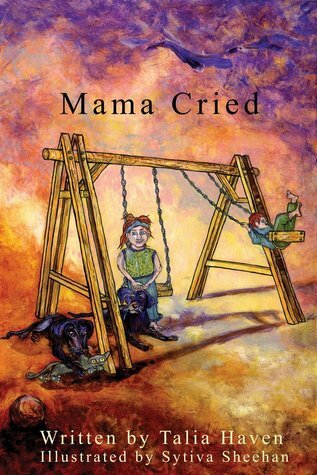 One day, when she is playing on the swings with her friends and puppies nearby, Jenna is asked to go with a woman, who asks and tells her mysterious things that are somehow related to Jenna’s memory of Mama crying. This story was actually a whole lot darker than I thought it was going to be. I called it ages 12+ because although you could read it to a young child, they would have no understanding of what was going on at ALL. There are some very subtle things that happen, and the whole plot, you are basically trying to figure out what happened to Jenna, and there is no way a young child would be able to understand that. I did thoroughly enjoy this book. It was not at all what I expected, and the young voice kept me interested until I knew enough that I was confused and wanted to know more. However, I did call it 4 stars, because there were a couple of ends left loose that I didn’t really understand and felt could have been left out. The ending was also unsatisfactory, and I felt like there could have been a bit more build-up. Overall, it was an incredibly short read (due to the length), but it was very interesting and kept me wondering until the very last words. That was simple enough! I was so worried about messing up this review, haha. You’ll probably see a lot more of these reviews (self-published and whatnot), as I am trying to read all of the books I was requested to review on vacation. 🙂 Definitely worth the read, especially if you’re looking for something quick that will stay with you for a long time. Toodles! Next ›For the first time in forever… A Top Ten Tuesday! YOUTUBE BOOKTUBE WHATEVER DO IT!!!! I’d watch!!! EEKK! HI ELM!!!! EEEEEK THANK YOU!!! I was totally scared about putting that out there because… Well… I don’t do face reveals haha. BUT IT WOULD BE SO FUN!!! THANKS FOR THE SUPPORT! YAY ON YOUR ENTIRE FAMILY BEING SUPPORTIVE!!! You’re gonna do BookTube? 😊😁 And RIP your laptop lol. Is it fixed? Woohoo! 🙂 I’m HOPING. Not really sure yet. I’m very nervous about the whole face reveal and VIDEO thing. Hahaha. Thank you so much! That means a lot to me. 🙂 BookTube is pretty cool! Okay, will do! Wow, congrats on the review request! You guys are LEGIT. 😀 I’m super duper happy for you about getting the support of your family, even to the point of going in on a camera for shooting YouTube vids. That is exciting! !